I helped a dentistry practice improve their new patient experience. Diamond Ridge Dentistry is a highly regarded private practice in Jefferson City, Missouri. The clinical team had noticed a lack of efficiency in new patient appointments, and the owner was concerned they weren't making the best first impression. 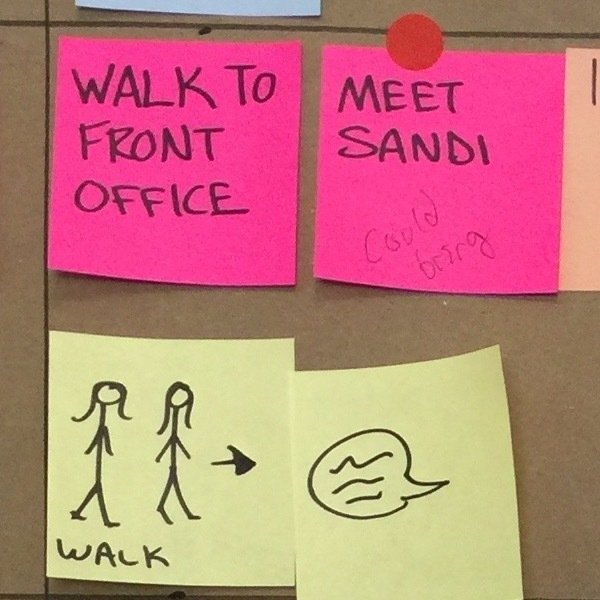 She asked me to run a workshop to identify her team's pain points. I saw an opportunity to exceed expectations by generating solutions if time allowed. The team identified eight pain points and solved two immediately. They successfully implemented the solutions at the very next new patient appointment. My intern, Paige Roche, assisted with workshop materials and documentation, designed the final report, and contributed numerous insights and recommendations. My research goal was to document the steps in non-emergency new patient appointments. I interviewed the dentist-owner and the office administrator, then scoured patient-facing and staff-facing forms and checklists to get a detailed understanding of the new patient appointment. Once I had drafted the sequence, I shared it with the office administrator to edit. The final sequence showed 46 steps taken and six actors in the new patient appointment. The office administrator edited the sequence in red. I assumed that not everybody knew what the other roles were doing, so I created an alignment diagram showing everyone’s contribution to the new patient appointment. Due to the large number of actors working in parallel, I chose the Blueprint+ format developed by Andy Polaine. I visualized the steps in the new patient appointment, assigning different colors to different roles (e.g., orange for the dental assistant). My goal was to make it easy to talk about what was hard. Feed the conversation about streamlining processes. Evaluate the system, not team members. We started by reading and revising the blueprint. Then the team shared stories from new patient appointments. They marked their pain points on the blueprint. A heat map of common pain points emerged. The team immediately implemented two solutions. 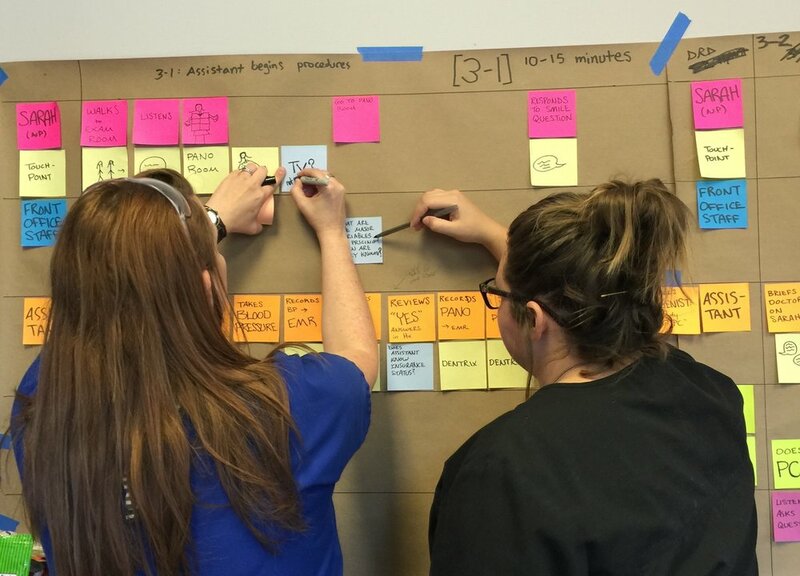 Although they had only intended to identify pain points, the team solved several problems during the workshop, implementing these two at the very next new patient appointment. For example, someone placed a red sticker to indicate a pain point on one of the last steps, meeting the billing specialist in the front office. Part of her job is to make sure the new patient commits to follow through on their treatment plan. Although she is highly skilled, she was having difficulty establishing rapport. When they encounter her, new patients are emotionally drained from the appointment. They have been meeting staff for the past hour. She is the fifth person they meet. Once we saw the issue, we quickly found a solution: What if the billing specialist greeted the new patient at the beginning of the appointment? She could walk them back from the waiting room to the exam room, building a little rapport along the way. This change would also save the busy dental assistants time without pulling the billing specialist away from the front office for long. The team successfully implemented this solution at the very next new patient appointment. Now new patients encounter a familiar face at the end of the appointment. Hygienists have more training than many people realize; they are qualified to diagnose certain conditions. Prior to this workshop, the hygienist would work with the new patient before the dentist. If they noticed an issue, they would diagnose it and enter it in the new patient's file. On some occasions, this caused tension, because patients only expected the dentist to wield diagnostic authority. The team solved this issue by changing the sequence. Now the dentist sees the new patient (diagnosing as needed) prior to the hygienist. Someone wrote "DOC HERE" at the top to suggest that the dentist see the new patient before the hygienist. Our report chronicled the results. We documented 8 pain points, 18 insights, and 15 recommendations. With my input, my intern Paige Roche designed a blueprint that incorporated the adjustments made during the workshop and calls out the unresolved pain points. With more time and resources, I would extend this project by prototyping and testing my recommendations and by analyzing other experiences besides the new patient appointment.